BBC survey: 23% of viewers could benefit from 4K TV broadcasts | What Hi-Fi? The BBC claims to have undertaken the largest ever survey of TV viewing habits in the UK, focusing on screen sizes and viewing distances as it weighs up making the leap to 4K broadcasts. The survey also revealed details on the most popular TV technology, the average age of our televisions, the number of people who add speakers to their TVs, and more. The BBC TV survey claimed 10 per cent of viewers would benefit from "better than HD" quality content based on current viewing habits - rising to 22.9 per cent if people were to buy the size of TV that they say they want (a noticeably larger one). These assumptions were based on the BBC's minimum necessary viewing distance of 3x the height of your screen to benefit from HD and 1.5x the height of your screen to benefit from 4K Ultra HD TV. The BBC said "these results will be used to help plan future services", a none-too-thinly-veiled hint that the corporation is sizing-up a move to 4K and HDR TV technology. The results of the BBC's survey, which have just been revealed, were collected between August and October 2014 - ten years since the Beeb's last survey of TV viewing habits in 2004. 2633 respondents took part of which 2416 were used. Of those, 2185 (90.4 per cent) had a TV. The key finding of the survey showed the current median screen size is 39.3 inches, and the median viewing distance is 2.63 metres. Interestingly, while the average screen size has increased since the last BBC survey, up from around 26 inches, the average viewing distance has stayed largely the same. The BBC claims the average screen size reported by women was around 36 inches, while the average screen size entered by men was 40 inches. The larger percentage of male respondents boosted the overall average. Crucial to the BBC's 4K plans was the question of what size TV people planned to buy next. 50.1 per cent of people said it would be a larger TV, with 39.9 per cent saying they'd stick with the same size. The most in demand TV size for a future purchase? 49 inches. It looks like the average TV size will continue to increase, a notion backed-up by the latest Gfk figures, which revealed 42 inch+ TVs accounted for the biggest growth area, while their figures (from October 2013-14) also suggested 11 per cent of UK households already had a set of 50 inches or bigger. When that next, bigger TV is going to be bought remains to be seen. 30.5 per cent of respondents had bought a new TV in the last two years, while 50 per cent had a TV that was 2-5 years old. Only 18.9 per cent had a TV older than that. Gfk suggests the replacement cycle for TVs is around 9 years. 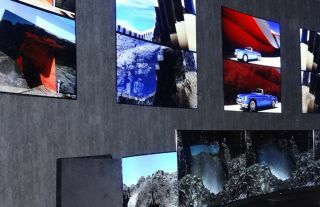 On the subject of TV technology, LCD/LED sets predictably dominate, with 72.8 per cent of respondents ticking that box. 14.6 per cent had a plasma TV, 3.8 per cent had a CRT, 1 per cent had a projector and the rest either had something else - OLED? - or weren't quite sure what they had. And what are we watching? Over 91 per cent of people watch broadcast TV, 61 per cent also enjoy Internet streaming, 68 per cent watch 'packaged media' (DVDs and Blu-rays) and nearly 40 per cent of respondents use their TVs for gaming of some description. To make the most of that viewing experience we'd always recommend that people add external speakers but a hefty 60 per cent of respondents to this survey said they still rely solely on their TV's speakers. A more impressive 17.9 per cent indicated they had surround sound speakers, 9.5 per cent had stereo speakers and 8 per cent had a soundbar. On average people admitted to watching 2-4 hours of TV per day - and we like doing it in the dark: 39.8 per cent of people preferred the room to be either dimly lit or completely dark when watching TV. Of course, not everyone had a TV - 10 per cent didn't in fact. But 90 per cent of those who didn't have a TV, did watch TV content on another device - 76.6 per cent on a laptop, 32 per cent desktop, 29.9 per cent tablet and 22.5 per cent on mobile. This means just 1% of respondents didn't consumer any TV at all (though people who don't own a TV were no doubt far less likely to take part in a TV survey...). We can only hope this survey means the BBC will look to invest in 4K Ultra HD broadcasts sooner rather than later, in line with the growth in the number of 4K TVs on the market (at more affordable prices and realistic sizes) and in people's homes. You can view the full findings, entitled 'A Survey of UK Television Viewing Conditions', on the BBC website here. Does the BBC survey's results reflect your own viewing habits? Let us know in the comments below.